With winter just around the corner, I am sort of thinking I should have chosen a different name for this salad! This is the perfect recipe to get through the cold months when fresh produce is not abundant. It is also a worthy counterbalance to the excesses of the holidays…like all that Oreo Bark! Loving salads as I do, it would be nearly impossible to choose a favorite. If pressed, however, this recipe might take the honors. It has been a staple in our house since I enjoyed a similar salad at a friend’s house years ago. Once the dressing is mixed, this delicious fall side can be pulled together in minutes. The dressing can be made ahead, will last for several weeks in the refrigerator, and will provide enough to dress multiple salads. My kids don’t care for Swiss cheese but, in this salad, they never seem to notice. The flavor subtly enhances the salad without overpowering it. If you don’t have Swiss cheese on hand, however, the salad is still delicious without. When fresh cranberries are available, I occasionally use them instead of the dried version. Their tart crunch is a nice counterpoint to the slightly sweet dressing. 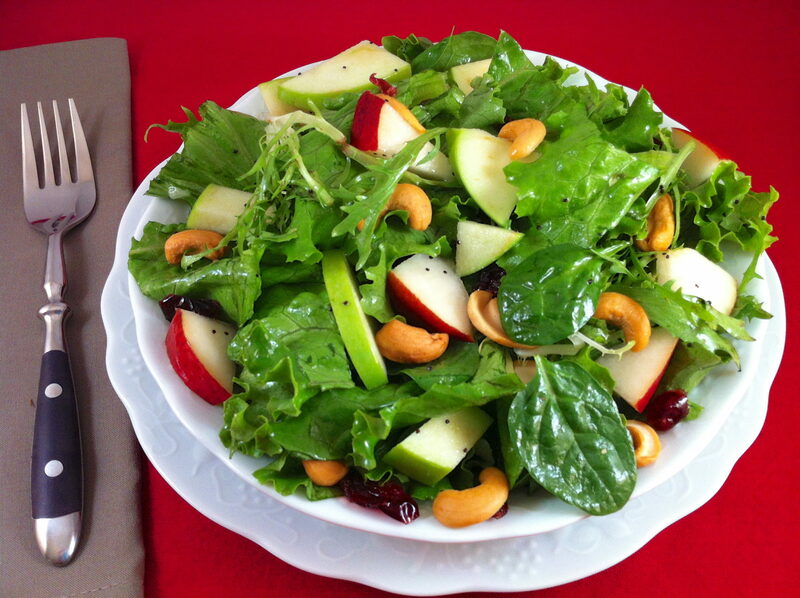 Helpful Hint: To make this salad ahead without the apples and pears turning brown, place the chopped fruit in the bottom of your salad bowl and toss with a couple of tablespoons of the dressing. ⇩⇩ Next add the lettuce and remaining ingredients, without tossing, and then cover and refrigerate. When ready to eat, simply toss and drizzle with more dressing if needed. I have prepared this salad several hours before serving time and the lemon juice in the dressing keeps the fruit crisp and bright. Combine the dressing ingredients in a jar with a tightly fitting lid and whisk or shake well to emulsify. 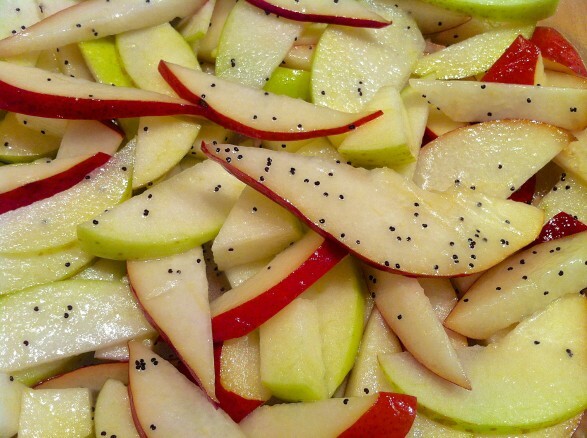 In a large bowl, toss the salad ingredients with the poppy seed dressing. Grate additional cheese over top, if desired. Refrigerate unused portion of the salad dressing. This will be enough dressing for several salads. Thank you for the lovely comment, Beverley, and I hope you enjoy this salad as much as we do! Another one I need to make soon! Looks as beautiful as I am sure it tastes great! Thank you very much for the thoughtful comment, Maureen! I hope you get a chance to make this salad and enjoy it…perhaps with some pizza! Very similar to a salad I fell in love with at a school potluck but never found out who made it so I could get the recipe! My daughters always tease me about all of the “really good salads” I rave about after every event we go to! I can’t wait to try this one! Hi, visiting thru Clever Chick’s party, this sounds delish! Def. giving this a try! So glad you found your way over, JoAnn, and hope you enjoy! Ann…. I stumbled upon another application for your wonderful Lemon Poppy Seed Dressing. I’ve never been a big fan of cole slaw but tonight I tossed a broccoli slaw in your dressing (instead of mayonnaise) and also added some cashews, grated swiss cheese, and craisins. The results were a lighter, lemony kind of slaw that was delicious! Thanks again! Excellent!! Subbed goat cheese and pistachios and it was well received… Hint don’t use juice from Meyer lemons as you need that acidic tang. The Meyer lemon juice was a little too sweet…but what a great salad!! Thanks so much for the comment, Allison, and for the Meyer lemon feedback. I have never tried this dressing with a Meyer lemon so never considered it. Your comment is bound to help someone else! Hi Ann! Made this dressing tonight with a variation on your salad..love the dressing! I had it with a simple pasta dish that is one of our favorites. I’ll email the recipe to you. That would be wonderful, Mary Lou, and I am so glad you enjoyed this dressing. It is one I look forward to every fall! I had a pear, some dried cranberries and I used slivered almonds since I did not have cashews. I even threw some blueberries on it. Really good mix of flavors and textures..especially with some shredded Swiss cheese.